By all appearances, tomorrow's election in New Zealand could sweep a young, energetic left into power. But appearances are deceiving. 2017 has been a year of seismic change. It started with Donald Trump’s inauguration. It carried over into the French and British elections. And now it looks like it’s coming to New Zealand. For the first time in nine years, the right-wing National government that’s led New Zealand for the better part of this decade looks close to being removed from power. What’s more, the government that could replace it is a left-wing coalition led by a young, charismatic, female leader, apparently smashing the moribund status quo of the last nine years. This is certainly the prevailing narrative sold by the New Zealand media: young versus old; change versus status quo. But is that the case? If anything, the 2017 election demonstrates the way that, despite its supposed progressivism, New Zealand’s politics in many ways lags compared to the rest of the developed world. While left-wing populists in the US, UK, and even France have challenged not just their political rivals but the political status quo, shifting their respective Overton windows, New Zealand hasn’t followed suit. The ingredients for some kind of populist revolt all seemed there: a major center-left party in the throes of decline; inequality and human suffering caused and exacerbated by decades of neoliberalism; and nine long years of such policies that have seen a further hollowing out of New Zealand’s much-vaunted living standard. Yet as Kiwis prepare to vote, no matter who wins, it looks increasingly like its post-eighties status quo is destined to stay untouched. You can’t understand the current election without understanding the broad strokes of the last thirty years of New Zealand history. For most of the twentieth century, New Zealand was a prosperous if somewhat socially conservative and closed-off social democracy, whose expansive welfare state and strong labor laws were the world’s envy. Until 1984, that is, when in the midst of economic crisis, the newly elected Labour government forced through a broad series of radical free market reforms, essentially rolling back the party’s own proudest achievements. The reforms didn’t actually do most of what had been promised — incomes stagnated, employment jumped — but they did have the peculiar effect of redistributing wealth to the richest while decimating public services. In the last few decades, governments in New Zealand have not attempted anything as radical as the reforms of the eighties and early nineties (though given their scale, they arguably didn’t need to). The Labour government that ruled through most of the 2000s even attempted to put in place a more robust social safety net and roll back some of the harshest reforms. Still, as with the rest of the developed world, there’s been a tacit consensus among all political parties that there’s no going back. The National government led by former prime minister John Key that took power in 2008 seemed to embody this. Key was akin to New Zealand’s Ronald Reagan: an impeccably smiley, relentlessly likable goofball and free market devotee who couldn’t seem to lose an election no matter how many scandals reared their head or unpopular measures his government carried out. New Zealand may not have always liked National and its policies, but they loved John Key, sending him to the prime minister’s office three times while Labour languished in the polls. Labour’s response was to studiously avoid re-embracing its social democratic roots — the party’s various leaders were all in on the TPP for years, and the party talked more about balancing budgets than working families — opting instead to offer a more compassionate alternative to Key and National rather than wholesale change. As Australian economist Bill Mitchell put it in his visit to the country, Labour’s message was “I’ll do austerity but I’ll do it fairer.” Uninspiring centrist leader after uninspiring centrist leader fell and was replaced like a pair of socks. It’s no wonder Key was always smiling. It didn’t hurt that the Key government was preternaturally savvy. Knowing the public wouldn’t accept a hard right turn, it opted for an incremental approach. And it knew when to triangulate: in 2014, an election year, Key passed a budget that included a families package worth nearly half a billion dollars for extended paid parental leave and free doctors’ visits for kids under thirteen, easily outflanking a Labour party whose sole pitch was offering such laudable but minor tweaks to the system. This approach resulted in nine years of right-wing success, including: tax cuts for the wealthy; the further selling off of publicly owned assets; the transformation of New Zealand into a tax haven (now being rolled back); allowing mining in conservation areas; the “reform” of welfare into a Byzantine, punitive system that did little to alleviate poverty; and the weakening of worker protections, such as the ending of legally mandated tea breaks. Of course, this right-wing success was, in practice, disastrous for the country, leading or contributing to a spate of slow-burning crises Key and his government ignored until they couldn’t. Among these were: exploding levels of poverty; a health and mental health system on the brink; inadequate infrastructure that is making the country’s biggest city increasingly unlivable; pollution levels that turned the country’s “100 percent Pure” slogan into a running joke; a ludicrously inflated housing market that condemned individuals and families to either permanent tenancy or homelessness; and what remains one of the developed world’s highest youth suicide rates. This isn’t even to mention the fact that New Zealand’s carbon emissions have actually increased, despite its “clean and green” image, nor the fact that incomes have stagnated as the cost of living has spiked, despite National’s continued insistence that things must be going well because GDP is high. Whether it was this convergence of crises or something else (whispers endure of a yet-to-be-revealed scandal) that led Key to see the writing on the wall, he abruptly resigned as prime minister in December 2016, handing the reins of power to his deputy leader and finance minister, Bill English. English, whose most interesting publicly known personality trait is the godawful pizza he forces his family to eat, lacks the pizzazz and likeability of Key. Prior to 2008, he was best known for helping run New Zealand’s healthcare system into the ground in the 90s and, in 2002, leading National to its worst ever election defeat, when he joined a charity boxing tournament and got the hell beaten out of him on national television. Not that this mattered. Despite his lack of charisma, and the collection of roiling disasters left to him by Key, English was still en route to giving Labour yet another drubbing as late as July. A lot can happen in eight weeks, more or less the length of New Zealand’s official election campaign. For most of the year, Labour seemed headed for its most disastrous result in history, seemingly another victim of the phenomenon that sees center-left parties hemorrhage votes in the long term by triangulating. The party’s leader, Andrew Little, was a former union official who had once pledged to get rid of one of Key’s more controversial laws, one that allowed employees to be fired without appeal in their first ninety days without being given a reason. By the end of his leadership, despite the fact that the law was an objective failure, he decided to keep it with certain tweaks. His trajectory in many ways mirrors the Labour party’s own history. In a further bid for the mythical centrist vote, Labour and the Green Party signed a budget agreement six months out from the election, promising that they would deliver budget surpluses, pare debt down to 20 percent of GDP, and keep core spending to 30 percent of GDP (bafflingly, the agreement also promised to future-proof New Zealand against climate change, something that was at odds with its pledge to avoid spending money). This was despite the fact that years of polling showed that New Zealanders barely cared about government spending, and were most concerned about housing affordability, economic inequality, and poverty, the two parties’ natural territory (at least in theory). As its campaign slogan, Labour adopted “A Fresh Approach,” inadvertently signalling that they didn’t believe there was anything substantially wrong with how the country was being run. At a loss for how to differentiate themselves from National, and seemingly unwilling to re-embrace its own roots, the party even adopted an anti-immigration stand, and at one point suggested that immigration was partly to blame for the country’s high rate of youth suicide. Even Little’s choice of the young and popular Jacinda Ardern, a former protege of the country’s last Labour prime minister, to be his deputy didn’t help poll numbers. Labour’s collapse was good news for the minor parties — two in particular. The Greens got a boost, polling as high as 15 percent at one point, as unexcited Labour voters sought out a left-wing alternative. But perhaps the biggest beneficiary from Labour’s collapse was New Zealand First, a self-styled “centrist” party that has waved the flag of “economic nationalism” long before Trump made it cool. NZ First reached new heights of popularity, giving it the status of potential kingmaker — the party that would ultimately decide the election by choosing whether to go into coalition with Labour and the Greens, or National. NZ First has long held a unique place in New Zealand politics. On the one hand, it’s a socially conservative, anti-immigration party that has promoted law-and-order policies and stoked xenophobia in previous elections. On the other, it’s the only party whose explicit goal is to end the “neoliberal experiment” of 1984 and its economic policies are often to the left of Labour. It made sense then, as I found out when I attended the party’s annual conference in July, that its ranks included disillusioned former Labour supporters and others who had been left behind by the free market policies of the past thirty years. Tailoring its message to the forgotten and fading regional towns of the country, and coupling it with anti-immigrant sentiment, the party’s support surged. For a time, with Labour in its death throes and NZ First’s message a seeming winner, it seemed like New Zealand politics could be headed for a significant realignment. And then just as suddenly, it wasn’t. As it stands now, Labour is at its strongest polling position in a decade. Though poll numbers have yo-yoed in recent weeks, both the Greens and NZ First were at various points close to dropping out of Parliament. The collapse for the Greens began when its female co-leader, Metiria Turei, made a calculated public admission that she had once committed welfare fraud as a young, struggling mother at university, in a bid to illustrate the iniquities of the country’s welfare system and its rich-poor gap. The admission actually led the Greens’ poll numbers to jump dramatically in the weeks following the admission, a fact that was forgotten in the ensuing controversy. But Turei was savaged by the press. Labour’s leaders publicly disapproved of her admission, and ruled her out of a ministerial role. Then reporters began digging further and found that around the same time, Turei had also once voted for a party in an electorate she didn’t live in, a non-scandal if there ever was one, but one that fed into an image of dishonesty. Continued hounding by the press for any further whiff of scandal ultimately led Turei to resign, ending her political career. The chasing of a Māori woman from her career for admitting to having fudged the facts twenty-five years prior in order to feed her family in the midst of harsh welfare cuts prompted little reflection from much of the media. It was made worse by the fact that Pākehā (white) men had gotten away with far worse: English, now prime minister, had cheated taxpayers of tens of thousands of dollars years before, and likely would have continued to had it not been uncovered by the press; Key and his wife had pretended to live in another property for years, allowing them to vote in the area, which had no effect on his career. Nonetheless, the Greens took a tumble in the polls. The biggest blow, however, was struck by the unexpected resurgence in popularity for Labour. Little, who had taken on the listlessness of a ghost haunting the empty halls of a mansion in a suit of armor, admitted to the press as Labour plunged to embarrassing new lows that he had thought about resigning, which, somewhat comically, led to his ouster. Jacinda Ardern became the new Labour leader eight weeks out from the election. 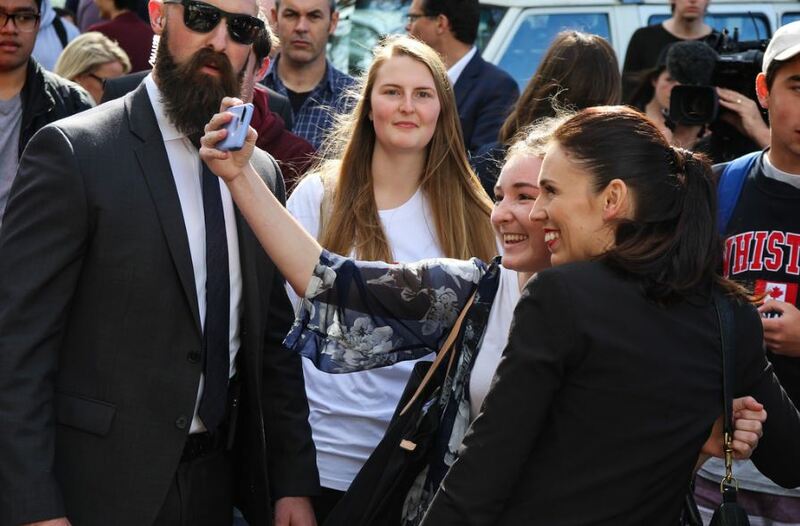 The ascension of the thirty-seven-year-old Ardern, known for her love of whiskey and her DJing stints at local music events, led to a surge in donations and volunteers for Labour. Ardern stressed her concerns about poverty, environmental degradation, and the country’s housing crisis. She received adoring headlines and coverage, both in New Zealand and around the world, particularly when sexist interviewers gave her the opportunity to strike back in video snippets practically begging to go viral. Frenzied crowds of young people greeted her at campaign stops. Labour shot up in the polls, at one point overtaking National for the first time in more than a decade. It was almost enough to make you forget that, well, nothing much had changed. Ardern herself admitted the Labour platform would be more or less identical under her leadership. Sure, the party now decided to fast-track its plan for free tertiary education, and introduced a tax on the commercial use of water, both laudable moves. But these alone were hardly measures to justify the frenzied level of excitement Labour suddenly received. Under Ardern, the party has continued to commit to its much-criticized anti-immigration policies, as well as its austere budget promises. Ardern has aso refused to campaign on introducing a capital gains tax (New Zealand is one of the few developed countries not to have one, a boon for property speculators), instead establishing a “Tax Working Group” to work out if it’s a good idea, one whose recommendations will only be ready once the election finishes. It was a transparent ploy to avoid having to actually defend the moral and fiscal necessity of a capital gains tax on the campaign trail, and became such a source of embarrassment that Ardern was forced to rule out implementing any new taxes that the group suggest in her first term. No one has yet asked the question of how exactly Labour plans to deal with climate change, eliminate child poverty, and end the housing crisis while keeping spending low and not levying any new taxes. Too many commentators to count have compared Ardern to Canada’s Justin Trudeau, a comparison that’s meant to be flattering, but is a lot more ominous for anyone who’s paid attention to Canadian politics. Trudeau, after all, has mastered the art of papering over his betrayal of his own values through sheer force of charm, social media manipulation, and outspoken wokeness like few other politicians. It’s still not clear whether Ardern is indeed New Zealand’s answer to Trudeau. But there are red flags. Despite having been the president of the International Union of Socialist Youth, Ardern also spent two years working for Tony Blair, something she now says was a morally agonising decision that she reluctantly took. Almost entirely unreported was the agency she actually worked for: the Better Regulation Executive (BRE). The BRE was a government department set up by Tony Blair devoted to saving costs for businesses by slashing regulations, a mentality which most recently resulted in the Grenfell disaster. Its first chief executive proudly told the Sunday Times that the BRE’s mission was “a radical and aggressive agenda for reducing the cost of doing business,” and he asked businesses themselves to send him suggestions for which regulations to cut. It was tasked with cutting inspections by a million per year, its staff members shadowed departments and suggested cuts, and it implemented the UK’s increasingly absurd one-in, one-out program on regulations, which soon turned into one-in, two-out, then one-in, three-out. The agency’s former chief executive recently penned an op-ed advising Trump on how best to carry out his own version of this program, helpfully suggesting that he focus on the cost of a regulation: in other words, if a new regulation costs $1 billion, cut two that are worth $2 billion. Perhaps Ardern’s time there was simply youthful folly. But on the campaign trail, she has been anything but bold. When asked in a television debate which was worse, tax evasion or welfare fraud, Ardern declared that they were equally bad. When asked her personal feelings on making medical marijuana legal, she said she preferred to leave it to a referendum. When the moderator pointed out he was looking for her personal opinion, she insisted that’s what it was. Ardern’s greatest political skill lies in presenting an earnest and caring face that offers few concrete solutions for the problems she names. She confidently told one interviewer that, yes, neoliberalism had failed, but when pressed, couldn’t name a single element of neoliberalism she would roll back. Ardern marched in the street against asset sales, explaining that privatization had deprived the government of revenue, but ruled out buying any of them back because they were too expensive. And despite declaring in a well-publicized speech that climate change is her “generation’s nuclear-free moment” (New Zealanders are hugely proud of the country’s stand against nuclear power and weapons) and that she was “determined that we will tackle it head on,” she refused to rule out any new coal mines or deep sea oil and gas drilling. It goes without saying that Labour’s policies would still go further in dealing with the cascading issues facing New Zealand than those of National, which over the past nine years has not only moved New Zealand further into a free market direction, but also shown itself unwilling to do much of anything to deal with such issues. The question is, should Labour win, what kind of change would it bring? If the campaign is anything to go by, the answer is not a particularly significant one. Indeed, rather than following the Sanders-Corbyn model of offering a set of policies that might excite voters, Ardern and Labour have effectively flipped the John Key model of leadership against Key’s own party, betting that Ardern by herself is enough to get the party into power. Labour’s current popularity is almost entirely tied into Ardern’s appeal, which itself is entirely tied into her as a personality — as Labour’s campaign material makes exceedingly clear. As New Zealanders prepare to go to the polls on September 23 (September 22 in the US), the election is too close to call. Despite some late-game dishonest campaigning by National — who first invented a $11.7 billion “hole” in Labour’s budget, and are now falsely claiming Labour will raise income taxes — Labour could still form a government through a three-way coalition with the Greens and NZ First. This, however, will all depend on which way the notoriously unreliable NZ First decides to go. Should National get back into power, the party’s track record provides a good indication of the outcome: the country will drift further right, while its various crises will continue to be addressed less than sufficiently, if they’re addressed at all. In the nineties, English presided over the deterioration of New Zealand’s health sector because he couldn’t bring himself to break away from free market orthodoxy; there’s little reason to think things will go differently now. What will happen if Labour (with the Greens in tow) win is an open question. It’s possible Ardern’s vagueness and caution is a product of campaigning, and that Labour will adopt a far more bold approach once in power (though in the UK, it required an outspoken leader like Corbyn to drag Labour kicking and screaming further left). That remains to be seen. But if Labour wants to solve issues like child poverty, climate change, pollution, and inequality, it will need to think bigger once in power than its meek, personality-based campaign has allowed so far. Like the rest of the Western world, New Zealand is facing an incoming tidal wave of crises largely of its own doing, caused by the chronic underinvestment that began with its sharp turn to neoliberalism thirty years ago. Smiles and positivity won’t be enough to change that; you have to give people something to actually smile about.